I could write pages galore on screen alternatives, but we'll stick to the basic alternatives presently. In it's easiest form, your storyboard could be a text editor - in it's most advanced incarnation it could be your own custom application suite comprising of a storyboard program, a word processor and programs for speech recognition, email, project collaboration and OCR (optical character recognition). If you would like to use a basic text editor, then you could use Notepad that comes with Microsoft Windows. Mac OS X users will find TextEdit similarly useful. Also for Windows users, there is an excellent Notepad replacement called EditPad. Next in the hierarchy tier are word processors - you could use them as they are, or you could use them with a specialized storyboarding template. Such templates can also be printed to paper. If you want to create a template in your particular word processor, you can download a template in Adobe's PDF format here - this is very basic and you could emulate it in any word processor or even within PowerPoint. Now let's talk about 'the flow' - this is the unrestrained stream of thoughts originating from your creativity which forms a major part of your storyboard. In fact this is the only link between your abstract and physical storyboards. You can use sticky notes, both paper and electronic to keep track of your inspirational bouts - for a free electronic version of sticky notes, try Post-it Digital Notes. Keep yourself suitably involved with your ideas to prevent your flow being hampered with. Nevertheless, if the dreaded 'creativity block' strikes you, there are a few ideas here which could help you. Visit our Creativity Un-Block page. Every storyboard has elements - representation of actual elements of a finished presentation. These are in the form of text, video, sound, images and more. It's just that you don't put everything that's going to be a part of your finished presentation into your storyboard - the storyboard is an intermediate stage - what's more it's a link to preserve your ideas for use in the actual finished product. If the text part is longer, just put in the beginning lines to suggest which text you would be using correspondingly in the presentation. In the same way images and videos are represented as placeholders - and sound could be identified by some scribbled notes. Before we finish, here's a thought. Everything we have discussed here may or may not fulfill your requirements. Maybe this is all you need. Or perhaps your needs are specialized, and you need to do more. Whatever the situation may be, this is not a disappointment. The main thing to remember is that your ideas are important. With a little tweaking here and there, you can adapt solutions to suit you. Although we discussed only general mainstream requirements, there's no reason why you cannot adapt it for yourself with some refinement or changes. Do remember that the storyboard is an intermediate stage. While concept and visualization are the beginning stages, completion and delivery are the final stages. Storyboarding is right in between these other stages. To finish a presentation, you don't need a finished storyboard. 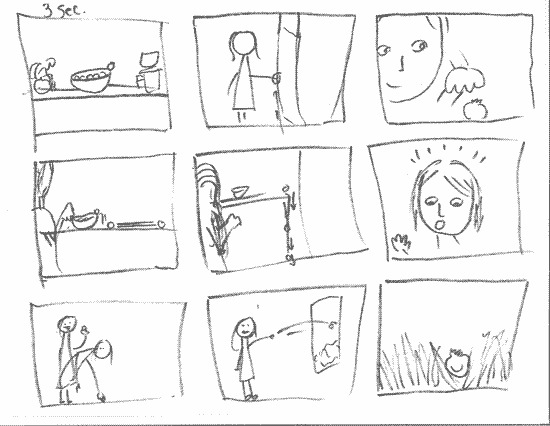 In fact a good storyboard will never get completed. As soon as your storyboard has a fixed direction, you should begin work on your presentation, maybe even before that. And some day, when your presentation is over, and you have won accolades, and some years after that, you may just see your old storyboard. And that storyboard will inspire you again, once more!